In Cambodia, paid television penetration is generally pretty low or otherwise unaffordable, and internet connectivity, particularly through mobile devices, is increasing by leaps and bounds. Due to this trend, this has prompted the release of various entertainment platforms that can be accessed from any device, anytime, anywhere and viewership in Cambodia has definitely proved to be some of the highest in the region! Delving deeper, we at Geeks in Cambodia got the chance to interview representatives from both SOYO and iflix to get a deeper understanding of what each platform can provide to its Cambodian users currently and in the future, as well as ultimately, what this means for the online streaming scene in Cambodia. As the first Cambodia-based Video-On-Demand (VOD) platform, Soyo aims to provide Cambodian smartphone users, movie lovers and social media users with an entertainment application that can help them relax and catch up on their favourite shows and movies after a very busy day! Named using a combination of Japanese and Chinese words that translate to relaxation and enjoyment without boundaries and using the VOD model of ‘Anytime, Any Where and Any Device’, Soyo was created as the team behind it saw an impending space for products that are on demand because today’s on-the-go lifestyles constantly seek for services that can provide everything immediately and conveniently. Highlighting this problem, as well as the issue of individuals becoming increasingly busy, Soyo realised that people needed a solution to make time for their favourite television shows or movies, without having to leave their individual comforts amidst their bustling schedules. Hence, now Soyo offers users access to thousands of hours of entertainment not only from Cambodia itself but from many other countries like Thailand, Korea and even the USA. Soyo also offers niche content geared towards the locals. 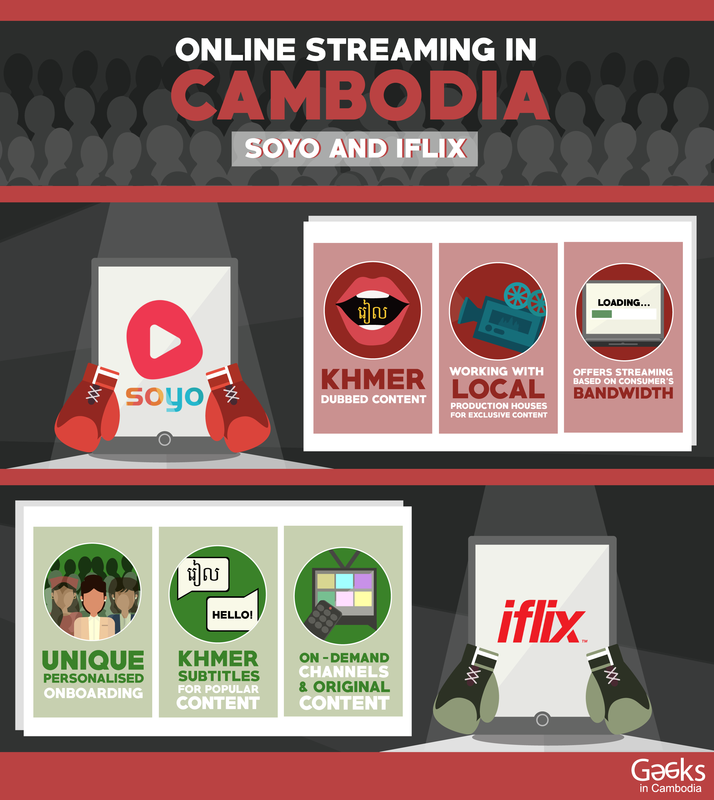 Firstly, Soyo focuses on content that is mainly selected for the Cambodian market, so one of the unique points that Soyo has is their Khmer dubbed content, a feature not many streaming applications have at the moment. Though some may debate that focusing greatly on Khmer dubbed regional content may have its cons, Soyo believes that there are probably still a million or so users out there who really enjoy watching Khmer dubbed video content, and in parallel they are also looking to develop the local industry and commission exclusive content as well to balance everything out. Besides that, to make sure this platform can be accessed by the masses, users can also select the streaming quality based on their preferred bandwidth. This feature especially caters to those in the provinces where Internet connection may not be as readily available; hence users can pick a lower video resolution that takes up a lesser bandwidth so they can still watch their favourite shows and movies comfortably. As for its future plans, Soyo is currently working with local production houses on fresh and exclusive content and by doing this, they hope to bring Live TV to Cambodian users. Additionally, they are also working on an offline download feature, which they hope to announce in time to come. Originally hailing from Malaysia, iflix has finally set shores in the Kingdom as part of its regional expansion! Iflix aims to provide Cambodians who love watching shows and movies thousands of hours of on-demand content. 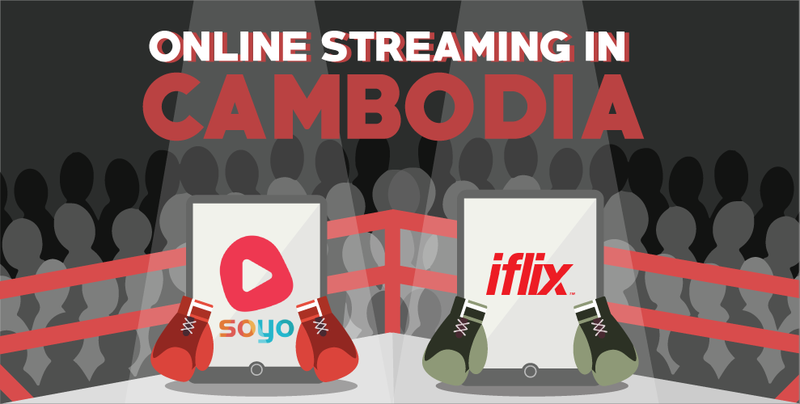 Alternatively, iflix hopes to be a platform that helps to deter piracy by providing the latest content to Cambodians fast and legally, so they do not have to look elsewhere for their favourite shows. As part of their penetrative strategy in Cambodia, iflix has initiated mutually beneficial partnerships with telco providers, like Smart Axiata, to deliver great content in bundles. This integration value-add has helped to keep telco customers loyal and even serves as a service differentiator. Due to such partnerships, customers get to access iflix as part of an existing service at no additional cost and get exclusives such as an initial three-month offer and Stream On packs. Similar to Soyo, iflix also made different efforts to localise the content they put out. The 150-strong iflix team and the 3 dedicated language hubs that service each region’s translation demands into 10 languages are heavily focused on expanding and improving translating and subtitling efforts to deliver the best possible experience for our customers in their native language. Besides subtitling efforts, iflix also makes sure the content put out are in line with the local language, culture, law, customs and censorship rules; despite offering an array of international options. On top of that, iflix offers unlimited download capabilities for offline viewing to its subscribers, an ideal solution for those without consistent internet or data connections. Subscribers are able to download a maximum of 10 shows in total per device at any one time for 7 days or 48 hours upon viewing, before they self-destruct. For iflix’s future plans, they are planning come up with more features to make the online streaming experience way more personal, other than adding more international, regional and local content. There will be a Playlister feature for subscribers to discover new shows coming out soon and they are all curated by dozens of popular Cambodian influencers and celebrities. Furthermore, iflix is heavily focused on working with talented local story-tellers and content creators, to feature local talent in the local language and we will be producing more original content in the future. An example of this is iflix’s recent partnership with the Philippines ‘Queen of Media’, Kris Aquino, one of the country’s most influential and celebrated actresses and public figures, to produce an original drama series. iflix plans on doing something original like this with Cambodian artistes as well soon. Currently, online streaming in Cambodia is still at its infancy stages. This means that there is more potential for even greater growth in this sector in the coming years. As Cambodian consumers get more hungry for more entertainment solutions and more quality content, this will result in a higher demand and likely invite other international and local players into the market. Though there is a risk of higher competition amongst different players, it definitely is good for the online streaming ecosystem as it lets all the players involved have a greater understanding of the subscription video-on-demand (SVOD) model. Ultimately, this will prove to be more positive for Cambodians in the long run as it means that there will be more state-of-the-art entertainment options in the future! However, while we wait for more SVOD platforms to join the current arsenal of online streaming platforms here, at least Cambodians will be able to utilise two quality ones for the time being! If you want to find out more about Soyo, you can visit their website here and if you want to learn more about iflix, you can visit their website here too.